We need something to discuss when it comes to the Buffalo Sabres. April still seems like a long way off, as about a quarter of the season has yet to be played. This season has been unexpectedly bad, as the team has gone from a .476 winning percentage (total points divided by possible points) to a .375 winning percentage from year to year after Monday’s loss to Washington. A .100 drop in a season has only been accomplished five other times in Sabre history. But there’s always hope (otherwise, what’s the point of rooting?). Let’s look at the five Sabre teams in chronological order that had the biggest one-season improvement in winning percentage, and see what road they took. New faces: Rene Robert, Jim Schoenfeld, Larry Carriere, Hugh Harris, Larry Mickey, Tim Horton, Norm Gratton. Departed: Ray McKay, Ron Anderson, Jim Watson, Kevin O’Shea, Danny Lawson, Phil Goyette, Chris Evans, Al Hamilton. What went right: Plenty. Defensive help arrived in the draft in the form of rookies Schoenfeld and Carriere, who received great tutoring by all accounts from Horton. Robert, who was acquired late in the previous season, became an 80-point scorer and a star. Jim Lorentz, Don Luce, and Craig Ramsay all took steps forward. What happened: Some great trades mixed with good drafting to create a team that was ready to take a leap in the standings only two seasons after creation. The seeds had been planted in the previous years. 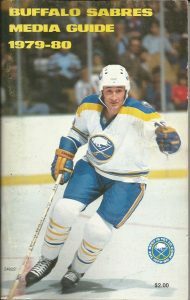 It also should be noted that the Sabres did a good job of keeping their key players while other teams were “raided” by the World Hockey Association. That may have helped Buffalo improve its team relative to the rest of the league, accounting for some of the improvement. New faces: Danny Gare, Brian Spencer, Fred Stanfield, Jocelyn Guevremont, Bill Hajt, Lee Fogolin, Morris Titanic, Gary Bromley, Floyd Smith (coach). 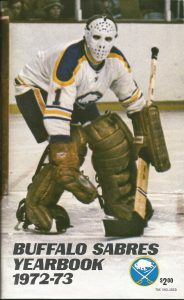 Departed: Gerry Meehan, Mike Robitaille, Steve Atkinson, Doug Rombough, Paul Terbenche, Tracy Pratt, John Gould, Tim Horton, Dave Dryden, Joe Crozier (coach). What happened: A lot went wrong with the Sabres the previous year. Gil Perreault and Jim Schoenfeld suffered major injuries, and Horton died in an auto accident. A rebound of some sort was expected, but the team did even better than that. 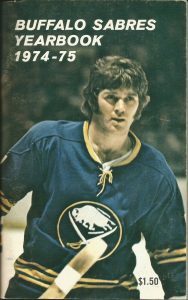 Trades for players like Spencer, Stanfield, and Guevremont filled in some holes, and other spots were taken by young players like Gare, Fogolin and Hajt. About the only major flaw was in goal, where no clear No. 1 emerged among Bromley, Roger Crozier and late-season acquisition Gerry Desjardins. The biggest problem this group faced after this season was that the Montreal Canadiens were about to start a dynasty in 1976, and no one could beat them when it counted for four years. Previous season: 38-26-16 for 88 points (.550). New faces: John Van Boxmeer, Richie Dunn, Rick Dudley, Lindy Ruff, John Gould, Bob Mongrain, Rob McClanahan. Departed: Rene Robert, Jacques Richard, Lee Fogolin, Bill Stewart, Terry Martin, Gary McAdam, Jocelyn Guevremont, Ken Breitenbach. What happened: The Sabres had something of a nervous breakdown the year before, getting off to a bad start. They fired general manager Punch Imlach and coach Marcel Pronovost, and later lost in the first round of the playoffs. Scotty Bowman came in as coach and GM from Montreal, and he got a lot out of that group. The Robert-for-Van Boxmeer deal probably showed that no one was untouchable, but the rest of the core stayed put. The 1979-80 team was talented, and it stayed healthy – eight key players played all 80 games. Don Edwards and Bob Sauve were brilliant in goal. The team played to its full potential. Still, those Sabres weren’t good enough to beat the Islanders in the semifinals, and New York started a four-year run of its own that year. 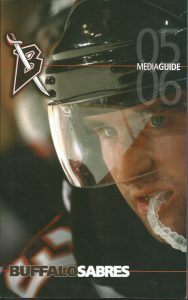 New faces: Tim Connolly, Thomas Vanek, Teppo Numminen, Jason Pominville, Paul Gaustad, Mike Grier, Toni Lydman, Ryan Miller. Departed: Miroslav Satan, Alexei Zhitnik, Curtis Brown, Chris Taylor, James Patrick, Eric Boulton, Mika Noronen. What happened: The lockout cost the NHL the 2004-05 season, so 2005-06 was an unusual year. General manager Darcy Regier cleaned out most of the guys who were left over from the 1999 team that went to the finals, and replaced them with young players plus a couple of trade acquisitions. It couldn’t have worked out much better. Miller, Vanek and Pominville all made major contributions for years to come, and the other new faces were useful as well. If that team had kept its defense healthy through the playoffs, it probably would have won a Stanley Cup. 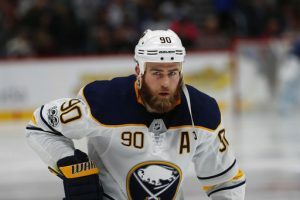 New faces: Ryan O’Reilly, Jack Eichel, Sam Reinhart, Evander Kane, Jamie McGinn, Zach Bogosian, Cody Franson, David Legwand, Jake McCabe, Mark Pysyk, Carlo Colaiacovo, Chad Johnson, Linus Ullmark, Dan Bylsma (coach). Departed: Chris Stewart, Drew Stafford, Brian Flynn, Nikita Zadorov, Andrej Meszaros, Cody Hodgson, Torrey Mitchell, Tyler Myers, Andre Benoit, Patrick Kaleta, Jhonas Enroth, Michal Neuvirth, Ted Nolan (coach). What happened: It’s amazing what can happen when the organization is trying to win games. General manager Tim Murray made a major housecleaning after what is commonly called “the tank year” and brought in a ton of new faces. 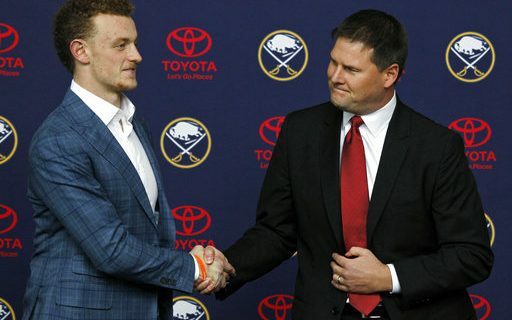 That included Eichel, the “consolation prize” for not winning the draft lottery that summer. Four of the top five scorers on the 2015-16 team were new, including Eichel. Trades brought in players like O’Reilly and Kane. It was quite a jump in points for these Sabres even though projected No. 1 goalie Robin Lehner only played in 21 games because of an injury. But the team didn’t continue to grow the next season, taking a slight step back in 2016-17 to 78 points. Two of the teams listed here went from rather bad to decent, and the other three teams jumped from average to excellent. In hindsight, most of these teams had some good draft picks ready to contribute. Some were stars, of course, but others were role players who helped fill out the roster nicely. The Sabres clearly have had too many swings and misses at draft time lately. For example, Buffalo had five picks in the first three rounds in 2014, and only one has played more than 10 career games in the NHL (Sam Reinhart). The Sabres’ 2011 draft picks combined for only 20 games in a Buffalo uniform. That’s hurting them at the moment. It’s never easy to look at an 18-year-old and figure out what sort of player he will be at 23, but the Sabres have to do a better job at it in the near future. Besides, it’s difficult to hit home runs on trades, and free agent signings can lead to cap problems if they don’t live up to expectations (see Matt Moulson). Need some good news? Buffalo has been unlucky this season. The Sabres are 7-21 in one-goal games, 10-23 in other games. Bad teams are supposed to do better in close games than blowouts overall, so chances are good that Buffalo has not had fortune on its side. That should even out in 2018-19. Besides, teams that decline in one season tend to improve the next. Even if nothing changed next season, the Sabres would be expected to be a little better. But things will change next season. Casey Mittelstadt could help as soon as this fall. The draft lottery might go the Sabres’ way, resulting in defenseman Rasmus Dahlin landing in Buffalo. Linus Ullmark, Alexander Nylander, and Brendan Guhle should be up from Rochester and ready to contribute here next year. And that doesn’t include roster changes at the trading deadline, designed to give up some of the present (mostly in the form of departing free agents) for a better future. The Sabres could be ready to go in the right direction by next season if they get the right answers to those questions, but there are no guarantees. That’s probably not what an impatient fan base wants to hear right now.